An incredible 32,000 people came to the final night of an Adventist outreach in the South Pacific. At least 10,000 of them were young people. The meetings were held in the city of Honiara, capital of the Solomon Islands. About half the population came to at least one night of the 10-meeting series. 524 people were baptized on the final weekend. And after each person was baptized, they were given a lei around their necks. Hey! What else would you expect in the South Pacific! The big problem for the baptism was that it was held in a river with crocodiles. Yep, real live crocodiles. Young people held long poles to chase them away if any swam too close to the baptism. So the baptism candidates not only needed faith in God, but faith in long poles. A croc was seen nearby two weeks before the baptism. And a woman was killed by a croc in this river last year. So these guys weren't just playing a token role at the baptism. The meetings were conducted by American minister Pastor John Carter. It was the second-most successful Adventist evangelism series ever run in the South Pacific Division. This was the largest-ever Adventist baptism in Solomon Islands history. Ted Wilson, president of the General Conference, was impressed by the results. And why wouldn’t he be? 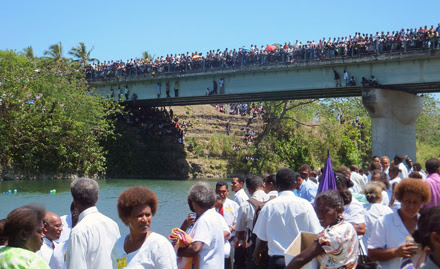 “The Holy Spirit is doing something unusual in Honiara,” he said. “We praise God for the large and enthusiastic attendance at the evangelistic meetings being held in Honiara by Pastor John Carter. It’s obvious that many are being drawn to the peculiar messages focusing on the Bible and its answers for today’s many problems." At the baptism, 29 pastors stood in the water, with a line of 18 or 19 people standing on the shore in front of each of them. Each candidate had his or her name on a card and gave the card to an organizer as they walked into the water. This was so that accurate records were kept of who was baptized. The local Adventist Church president says the 524 baptisms are only the first fruit of Carter's campaign. Several thousand more people handed in cards at the Carter Report program requesting baptism. Three thousand people attended the first meeting of a new Seventh-day Adventist Church in Honoira as a result of the series of meetings. You can read more about that at Record magazine's website. ---------------------------If you have a story you just want to share with the world, go ahead and send it to us! Like the article above, it may just get published on A Sabbath Blog!